Chester, a city located within Delaware County, one of the most affluent counties in Pennsylvania, represents a pocket of environmental, social, and economic deprivation. About 76% of its 40,000 residents are African American, a majority compared to the rest of the county where African Americans are approximately 6% of the population. In the 1090s, and after decades of economic and industrial decline, legislators and government authorities from Delaware County and Chester partnered with private investors to transform the city waterfront into a “waste magnet”. In 1985, a Pittsburgh investment company known as Russell, Rea & Zappala (and now Gomulka) partnered with Westinghouse Corporation to form Chester Solid Waste Associates to purchase land along Chester’s waterfront. Since then, the Pennsylvania Department of Environmental Protection has granted permits for the construction and expansion of several toxic and hazardous facilities. These facilities include waste treatment facilities, oil refineries, and trash incinerators. The Westinghouse incinerator is one of the largest in the country, burning not only 100% of Delaware County’s own waste, but the waste brought from surrounding states (New York, Delaware, New Jersey, and Ohio). Since the appearance of these industries, negative health outcomes continue to emerge. A report by the U.S. EPA in 1994 concluded that pollution sources in Chester explain the existence of unacceptable cancer and non-cancer risks, such as kidney and liver disease and respiratory problems. In reaction to this waste development, in 1992 neighbors from this area of Chester formed the community-based organization Chester Residents Concerned for Quality Living (CRCQL). In 1993, CRCQL filed a lawsuit against Thermal Pure Systems. After being first decided in CRCQL’s favor, the Pennsylvania Supreme Court overturned the ruling. In 1996, CRCQL sued the Pennsylvania Department of Environmental Protection (PADEP) under Title VI of the Civil Rights Act of 1964 for not considering the demographic composition of the city when granting permits to waste facilities. The court ruled in favor of the PADEP. However, in 1997 the Third Circuit Court of Appeals overturned that ruling. Before the US Supreme Court was to hear the case, Soil Remediation Services withdrew its application for a permit to operate. After years of community fight against these polluters, the Chester City Council approved an ordinance requiring new companies to prove that they would not contribute to increasing pollution levels in the city (legislation was watered down in 1999). The DELCORA sewage treatment plant has undertaken major facility improvements and agreed to fund a $200,000 community lead abatement program. In 1990s: Chester's infant mortality rate was the highest in the state; Chester's lung cancer mortality rate was 60% higher than the county; and 60% of children in Chester had blood-lead levels over the maximum recommended. Why? Explain briefly. There have been several victories (some facilities have closed, several proposals for new polluting facilities defeated, a few lawsuits won). However, residents in Chester keep suffering pollution from the several pollution facilities still in place and need to keep fighting every single facility that tries locate within their community. Czmus, Akim F. "Failure of Environmental Regulation: What Is a Poor Person to Do-Are the Civil Rights of Community Residents at Odds with Environmental Concerns-Chester Residents Concerned for Quality Living v. Pennsylvania Depatment of Environmental Resources and Thermal Pure Systems, Inc., 1993 WL 456285, The." Hamline J. Pub. L. & Pol'y 16 (1994): 101. Mele, Christopher. "Casinos, Prisons, Incinerators, and Other Fragments of Neoliberal Urban Development." Social Science History 35.3 (2011): 423-452. Foster, Sheila. "Justice from the ground up: Distributive inequities, grassroots resistance, and the transformative politics of the environmental justice movement." Cal. L. Rev. 86 (1998): 775. 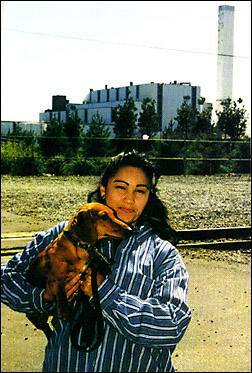 Maggie Santiago of Chester walks her dachsund past the American Ref-Fuel incinerator every day. She says that living near the plant has left her with a chronic scratchy throat and burning eyes. "Every year, I spend more on medicine," she says.